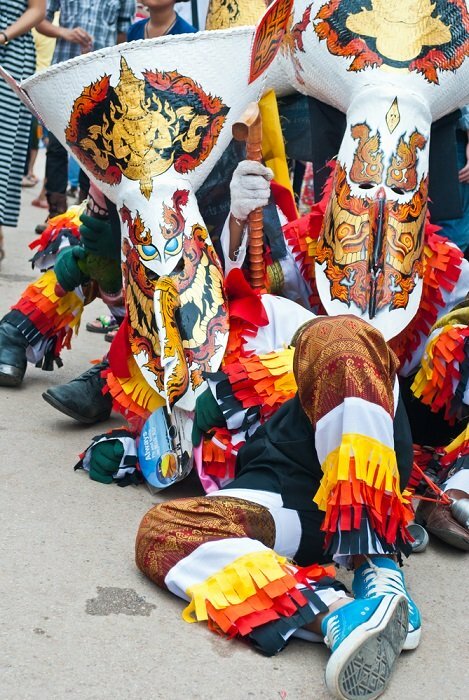 It's no secret tourists are drawn to Thailand Adventure Sports and there's no shortage of adrenaline-inspired activities in this neck of the woods. If you're the kind of guy or gal who thrives on getting down and maybe a little dirty with all the excitement, thrills and spills with perhaps a wee bit of danger thrown in for good measure, then perhaps I can point you in the right direction as far as adventure sports goes. I have partnered with a tour company that offers a serious number of hormone-induced options throughout the country. 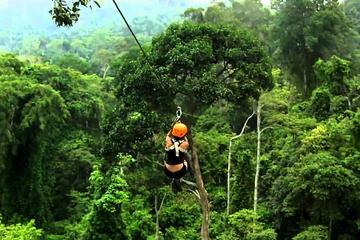 Below you'll find several hair-raising adventure tours in which to choose. Should you require any further information, please don't hesitate to contact me. 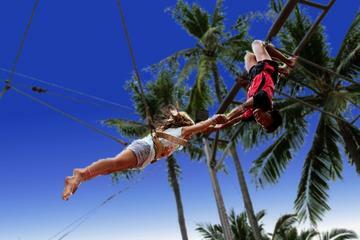 What's possibly going to stop you from swinging through the air on the Flying Trapeze on Phuket's Micky Monkey Beach in Mai Khao? When booking an adventure sport such as this one, you'll be able to choose a variety of packages to suit your interests no matter your age. 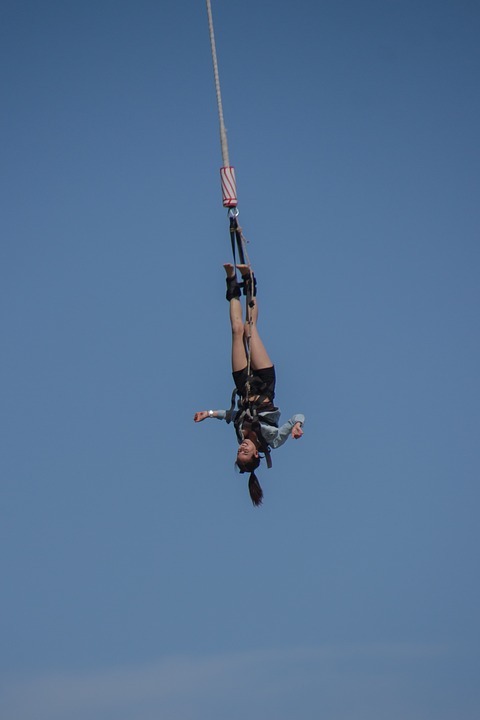 Full training is provided whether you want to do just one jump or you'd like to enjoy an unlimited period of flying with the option to attempt an ankle catch. Simply click on the link above to view all the details. If you require transport, that too can be arranged from select areas. 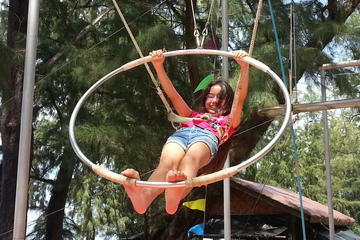 How about some Circus Ninja Warrior Training in Phuket? If this is something that's sure to get your kids flying like a kite, then this will be a real treat for them. Possibly for you too. Come and experience our unique activities and skill stations at Mai Khoa Beach in Phuket. Just 40 minutes from Patong, you'll escape the hustle and bustle and enjoy the panoramic views of this 5-Star Beach. Circus Ninja Warrior Phuket is right on the beach and in the shade all day. There's always a cool breeze, cold beverage and food waiting for you. 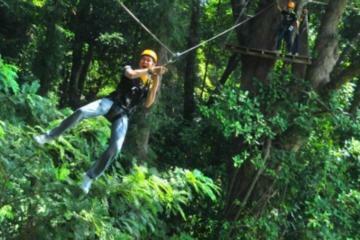 This Thailand adventure sports activity is not only great for the kids but also for the entire family to enjoy. Amazing sunsets and many happy hours too. 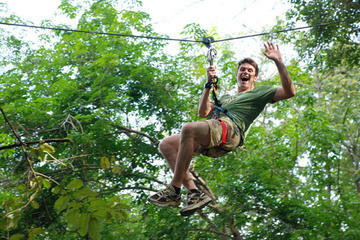 Here's an opportunity to immerse yourself in the jungle outside Phuket on an adventure that will set your heart racing. Try out Flying Hanuman, a 3-hour experience of flying through the trees on zip lines and encountering the spectacular wilderness of Thailand, first-hand. Calling all adrenaline junkies! This thrilling outdoor event from Phuket is a must-do Thailand adventure sports activity for children and adults who want to test their stamina at great heights. You'll get to climb, walk and swing through the treetops at Jungle Xtreme Adventures Park, a 3.5-hour challenge rope course that includes walkways, bridges, nets and zip lines. Well-maintained equipment and a safety briefing by experienced guides are all provided for your peace of mind. 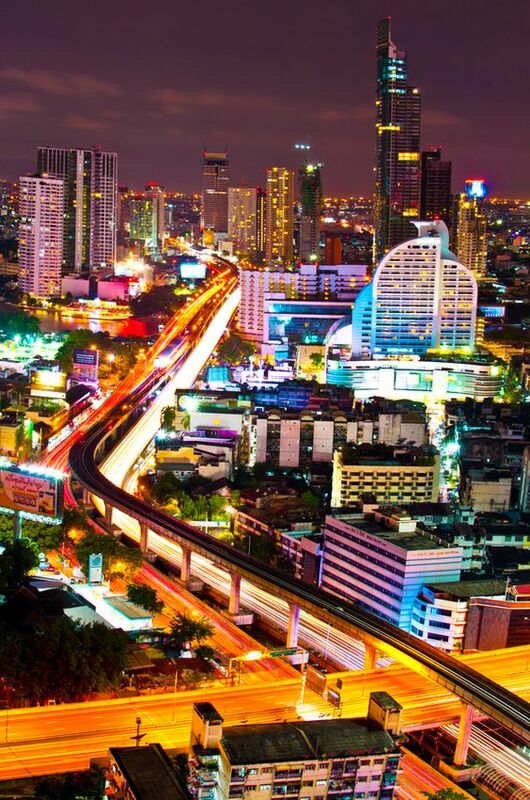 Also included is a pickup and drop-off from your hotel in Phuket town. How about soaring through the lush green forest at Hanuman World, a state-of-the-art zip line course equipped with 16 zip lines, several rappels and sky bridges, two spiral staircases, and one 'roller' — a thrilling ride that slides through the entire park. 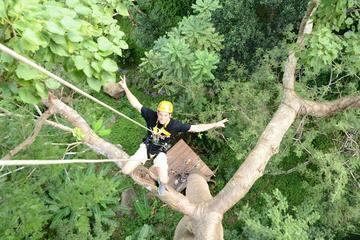 How about swooping between 30 platforms set high in the trees and satisfy your appetite with a Thai set lunch. Hotel pickup and drop-off is all included. You may choose your activity time anywhere from 08:00 am / 10:00 am / 01:00 pm. Please note that pickups at your hotel will happen 30 minutes to 80 minutes prior to your selected activity time. 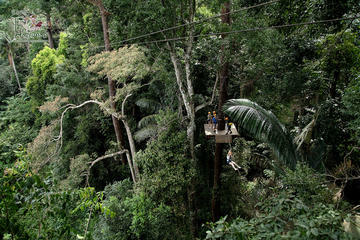 Take a leap of faith at one of Phuket's finest zip-lining adventure activities. It's a thrilling experience as you fly from tree top to tree top, 40 meters above the ground, observing the mind-blowing wilderness in a thickly forested environment. Experienced zip line guides are on hand to assist and instruct you so you for an unforgettable memory and to ensure your safety as well. Lunch and hotel transfer is included. How about an eco-friendly experience like no other? This one is called the Flying Hanuman and it's one of the top Thailand adventure sports activities you'll find in this neck of the woods. It's a zip line adventure that not only combines outdoor activities but also gets you up-and-close with parts of the ancient Phuket jungle wilderness while helping preserve the environment. Please see more details above.